An examination of how and why President Lyndon Johnson and his administration conducted the Vietnam war as they did. Decades later, the Vietnam War remains a divisive memory for American society. Partisans on all sides still debate why the war was fought, how it could have been better fought, and whether it could have been won at all. 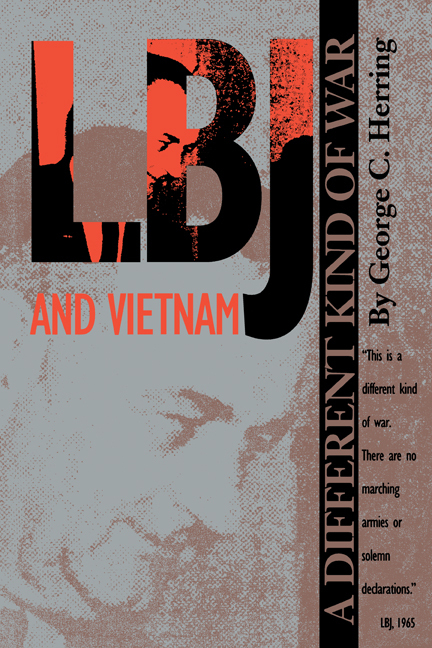 In this major study, a noted expert on the war brings a needed objectivity to these debates by examining dispassionately how and why President Lyndon Johnson and his administration conducted the war as they did. Drawing on a wealth of newly released documents from the LBJ Library, including the Tom Johnson notes from the influential Tuesday Lunch Group, George Herring discusses the concept of limited war and how it affected President Johnson's decision making, Johnson's relations with his military commanders, the administration's pacification program of 1965-1967, the management of public opinion, and the "fighting while negotiating" strategy pursued after the Tet Offensive in 1968. The author's in-depth analysis exposes numerous flaws in Johnson's management of the war. In Herring's view, the Johnson administration lacked any overall strategy for conducting the war. No change in approach was ever discussed, despite popular and even administration dissatisfaction with the progress of the war, and no oversight committee coordinated the activities of the military services and various governmental agencies, which were left to follow their own, often conflicting, agendas. Author of the best-selling book, America's Longest War , George C. Herring is an Alumni Professor of History at the University of Kentucky.